Rubberway rubber sidewalks are a flexible, porous, eco-friendly alternative to concrete sidewalks, asphalt, and preformed pavers. Made with recycled rubber from post-consumer tires, these rubber sidewalks can withstand heavy rain by providing rapid drainage, making them the perfect stormwater management solution for green city infrastructure. Rubber sidewalks are a low impact development technology that cities are embracing across the country. 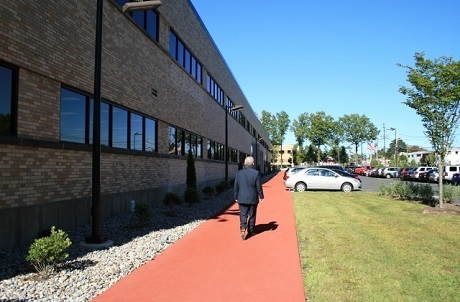 Rubberway rubber sidewalks have been installed across the United States for nearly two decades and have undergone rigorous testing to ensure durability, longevity, and cost-effectiveness. See our Competitive Analysis for a comparison of costs, installation, maintenance, specifications, and testing of Rubberway compared with rubber pavers, concrete, and asphalt. City and public works departments are constantly faced with the public safety concerns and financial burdens posed by sidewalks cracked and damaged by tree roots, freeze-thaw, and vehicular traffic. Rubber sidewalks are a great replacement for cracked sidewalks due to their flexible and porous nature. 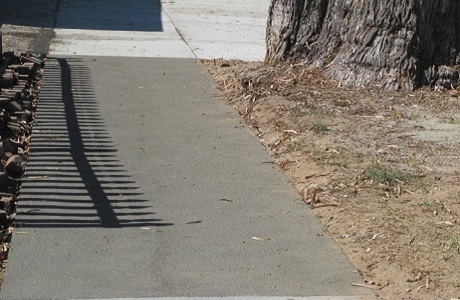 Rubber sidewalks will flex with the growth of tree roots rather than crack due to root heave - an issue all too common with traditional concrete sidewalks. In addition, the porosity of Rubberway allows water to penetrate into the subsoil where it nourishes tree roots below ground, encouraging deep rooting, reducing cracking and heaving, and making trees less likely to blow over in strong wind gusts. 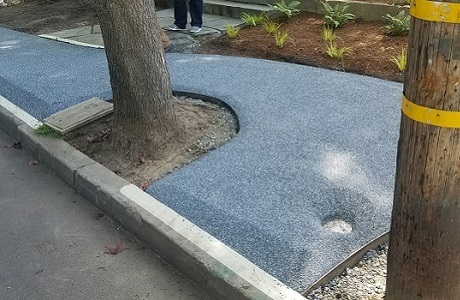 Rubberway rubber sidewalks can even be installed directly over tree roots without damaging them or hindering the tree's growth. Rubberway rubber sidewalk is a patented, poured in place system that utilizes post-consumer recycled tires for a modern, environmentally friendly sidewalk alternative. This porous rubber sidewalk system is customizable in color and design and can easily be installed on slopes, over mounds, and around curves. 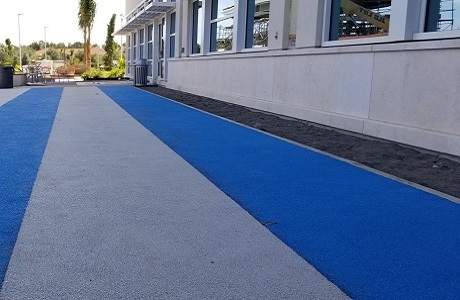 Rubberway's rubber sidewalk system consists of two layers: a base layer made from 100% recycled crumb rubber, topped with a "wear" layer of long lasting, fade resistant virgin colored rubber (EPDM). The rubber granules are small and compact well, yet allow for rapid drainage. The rubber granules for each layer are mixed with our proprietary binders at a specific ratio and then troweled evenly at a specified thickness. Rubberway can be installed on top of a layer of compacted/crushed miscellaneous base (CMB), concrete, or asphalt. Using concrete or asphalt as a sub-base will make the system non-porous, but will still capture the other benefits of rubber sidewalks including flexibility, resiliency, and safety. Sub-base requirements vary by region and should be altered accordingly. Please contact us with the details of your project and we will help ensure you get the right specifications for your needs. Reflectance: Lighter colors increase reflectance and reduce the absorption of heat. 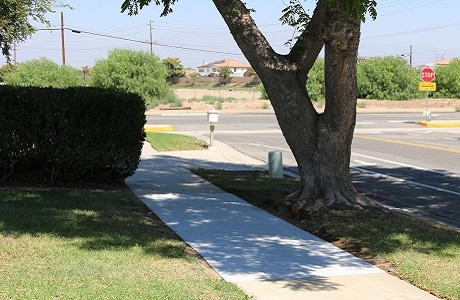 Rubberway Sidewalks in light gray and beige have a solar reflectance index (SRI) value of 31 and reflectance of 42. Thermal Emittance: Lighter colors also reduce the thermal emittance of surfaces. Rubberway Sidewalks in light gray and beige have a thermal emittance of 0.83. 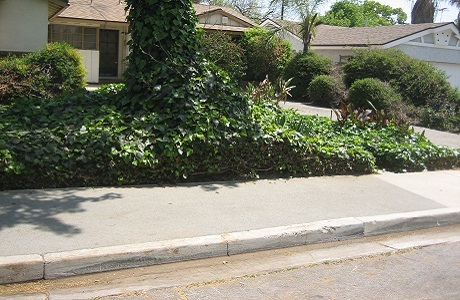 Tree and Shrub Preservation: Rubberway Sidewalks are porous and flexible, allowing water penetration to reduce root heave from water starvation which often results in destruction of the tree due to cracked sidewalks and public safety issues. 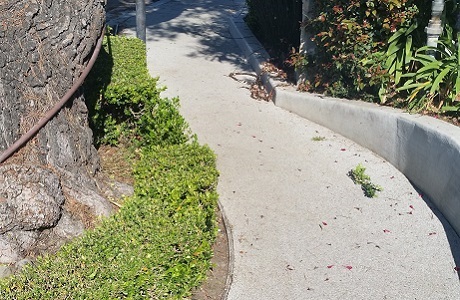 Rubberway Sidewalks allow urban trees to be left in place where they provide shade, retain moisture, and help reduce the urban heat island effect. 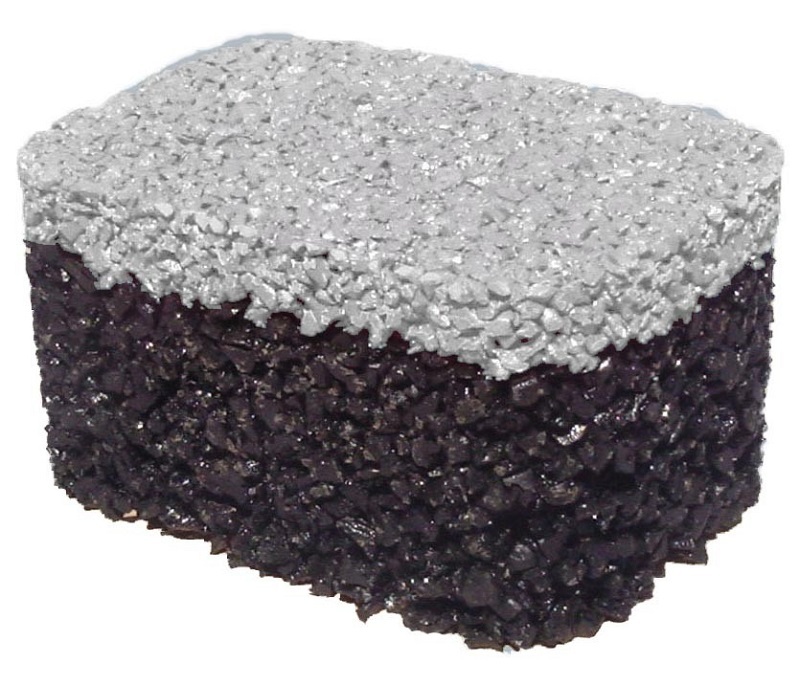 Rubberway systems utilize 100% recycled tires when all black crumb rubber is used. If a colored EPDM virgin rubber wear layer is used as well, the recycled content without binder varies between 66-100%. Rubberway systems in California utilize 100% locally manufactured or produced materials. Elsewhere in the USA, we source regional materials whenever possible. Rubberway pervious pavement systems allow rain and other sources of water to penetrate through to the subsurface, reducing the volume of stormwater runoff. Rubberway is an innovative green building technology that offers a permeable, resilient, colorful, attractive, and durable surfacing solution utilizing recycled tires. The system is seamless, preventing warping, curling, and dislodging; nonlinear, allowing it to follow curves, go around corners, and accommodate contour changes; and resilient, providing safe, comfortable traction, thus reducing liability damages from slipping or falling. Specifications, detail drawings, and brochures are available below. Contact us for help making your project a success.